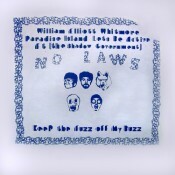 Notes: This is a LP that was released for the tour of Paradise Island(Jenny from Erase Errata’s solo project), Will Whitmore(aka William Elliot Whitmore) and FT(the Shadow Government) who were joined by their friend Jarrett Mitchell who did spoken word/comedy under the moniker Let’s Be Active.FT(the Shadow Government) is Joel Anderson(Ten Grand/Vida Blue) and Luke Tweedy with drums from Bob and Zach(Ten Grand/Vida Blue). They were also known as Flaccid Trip for awhile. The record covers are all screened differently in varying colors. All of these songs are exclusive to this compilation. 7. FT(The Shadow Government)-Who Invented the Difference?